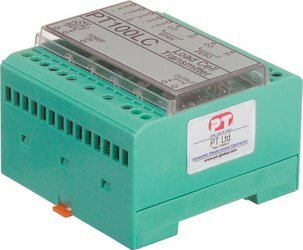 The PT100LC is a basic load cell conditioner with pre-set filtering and analogue output. It is easily mounted in control cabinets and connected to equipment with analogue input. : All Strain Gauge Types, up to 4x 350Ω. : 100~20 %, coarse and fine. : 75 mm x 75 mm x 55 mm (H). DIN rail mount. Brochure for PT100LC load cell conditioner. Brief installation instructions for the PT100LC load cell signal conditioner.